Design and develop professional web sites rapidly. 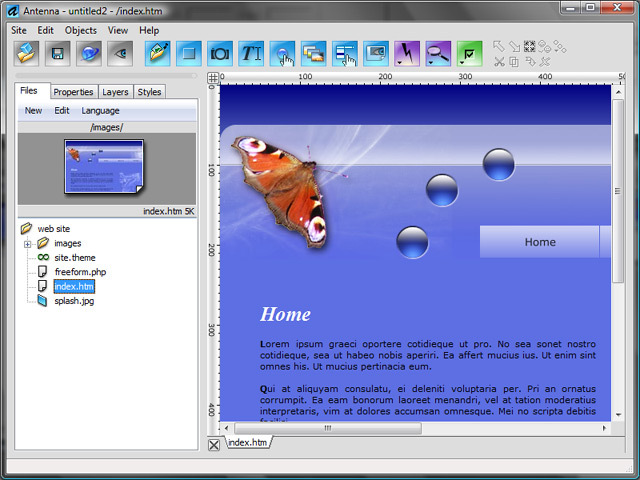 Antenna makes web site creation a visual experience - no coding or HTML knowledge required. It's pixel accurate, drag & drop environment leaves you free to concentrate on aesthetics and design, while powerful features such as a built in digital photo gallery creator, gradient designer, button maker and master pages are real time-savers. Have fun and make your own web site look stunning! ...... that's exactly where they will appear in the web browser. Add speech recognition and text-to-speech (TTS) to your Web pages. Qweas is providing links to Antenna Web Design Studio 3.5 as a courtesy, and makes no representations regarding Antenna Web Design Studio or any other applications or any information related thereto. Any questions, complaints or claims regarding this application Antenna Web Design Studio 3.5 must be directed to the appropriate software vendor. You may click the publisher link of Antenna Web Design Studio on the top of this page to get more details about the vendor.